Pahrump Valley High School wrestling coach Craig Rieger would love to see history repeat itself this weekend at the Class 3A Southern Region Championships at Moapa Valley High School in Overton. 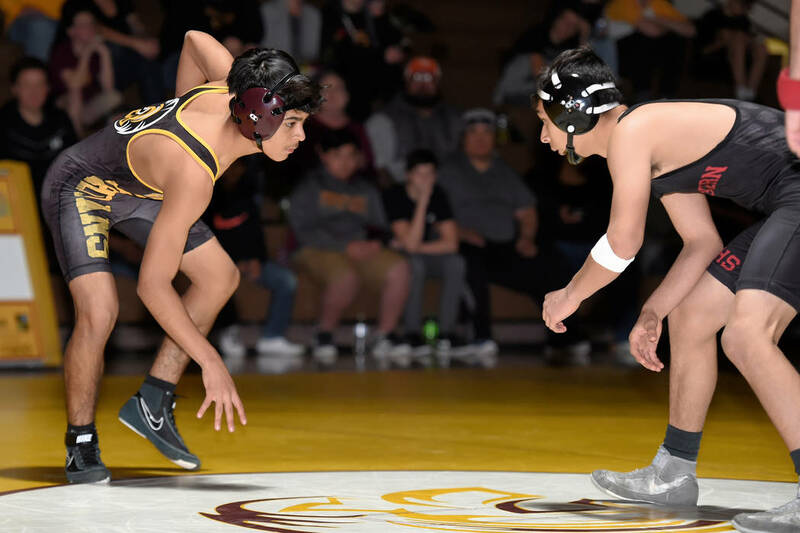 Peter Davis/Special to the Pahrump Valley Times Pahrump Valley freshman Henry Amaya, left, will take a 27-4 record into the Class 3A Southern Region Championship today and Saturday at Moapa Valley High School in Overton. Peter Davis/Special to the Pahrump Valley Times Pahrump Valley wrestlers will compete in the region quarterfinals, with opening ceremonies scheduled for 3 p.m. today at Moapa Valley High School. Quarterfinals will take place today, with the semifinals at 10 a.m. Saturday and the finals at 3:30 p.m. Saturday. Four years ago at Boulder City High School, the Trojans sent out two wrestlers at 195 and both responded, as Jax Clayton won the region championship with a second-period fall over Abraham Preciado in the final. They went on to place first and second again at state, which was held that year at the Winnemucca Event Center. This time around, it’s senior Tristan Maughan and sophomore Dylan Wright in the same class for the Trojans, and should they each place at 160 in the regions, they will go to the state championship, again in Winnemucca. Wright, who has wrestled at 170 and 182 this season, expects the typical advantage that comes when a quality wrestler is able to drop down a class. Just mentioning the kids up north shows you Wright has not exactly been focused on the regions as a goal. As a freshman, Wright finished second there at 145 and did the same thing at state. “We definitely have been looking at state, trying to place well at state,” he said. Wright acknowledged it would be a little tough to get down to 160, but he has been dominating wrestlers slightly heavier than he is all season. Maughan said his younger teammate told him about a week and a half ago that he planned on dropping down, but staying in that class also made the most sense to the senior. Cruz finished fourth at 132 last season and made a quick exit at state. He expects better results this time around. Just getting to state would be an accomplishment for many of the Trojans, as Rieger expects many of them to have tough paths at Moapa Valley. The top four in each class advance. 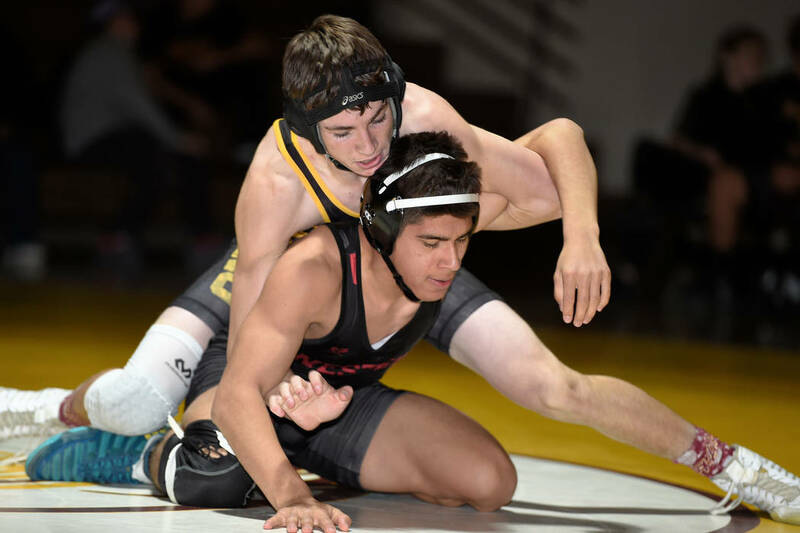 As for the team competition, going in with three weight classes vacant makes overall success a challenge for the Trojans, who finished third behind Boulder City and Virgin Valley last year. “We’ll be open at 120, 152 and 182,” Rieger explained. “At 120, Chris Vega was filling in (for Donnie Miller), but it’s such a deep, tough weight class, so we thought we’d give him the opportunity to wrestle JV. He was 3-2, and that’s good. At 152, we don’t have anyone with Grossell with his shoulder, and at 182 Dylan Wright is wrestling 160. Part of the struggle is that the more experienced Trojans find themselves in difficult weight classes. Rieger noted senior Spencer lane has wrestled well but that 138 is a loaded bracket. And junior Armani McGhee will be in a very deep heavyweight division. Exceeding expectations will depend heavily on freshmen, and Rieger said that while they have done well, the postseason is a different animal. But they do carry confidence into the regions, none more than Henry Amaya at 132. Amaya takes a 27-4 record to Overton. Every Trojan asked, including Rieger, said that the one school in the region they haven’t wrestled, Boulder City, figures to be a challenge, although exactly where the Eagles pose the biggest challenge remains to be seen. Cruz, for his part, isn’t overly concerned. Wrestling gets underway at 3:15 p.m. today at Moapa Valley. The finals will be at 3:30 p.m. Saturday, with the state championships slated for Feb. 8-9 in Winnemucca. 1o6: Mason Prunchak (3-0), Freshman. 113: Garrett Cosper (3-1), Freshman. 120: None. 126: Coby Tillery (3-1), Freshman. 132: Henry Amaya (3-1), Freshman. 138: Spencer Lane (2-2), Senior. 145: Isaak Cruz (4-0), Senior. 152: None. 160: Dylan Wright (4-0), Sophomore and Tristan Maughan (3-1), Senior. 170: Jesus Hurtado (1-1), Senior, Ty Hansen (0-1), Senior. 182: None. 195: Anthony Pearson (0-2), Sophomore. 220: Christian Monje (3-1), Senior. 285: Armani McGhee (2-0), Junior. 106: Did not place. 113: Did not place. 120: Donnie Miller, 5th. 126: Alex Torres, 4th. 132: Isaak Cruz, 4th. 138: Dylan Grossell, 1st. 145: Dylan Wright, 2nd. 152: Tristan Maughan, 2nd. 160: Braylon Durazo, 1st. 170: Angel Pinzon, 4th, and Dee Brown, 6th. 182: Cole Walker, 2nd. 195: Jeremy Albertson, 5th. 220: Morgan White, 2nd. 285: Armani McGhee, 4th. Team scores: 1. Boulder City 273, 2. Virgin Valley 217, 3. Pahrump Valley 207, 4. Mojave 169, 5. Cheyenne 134.